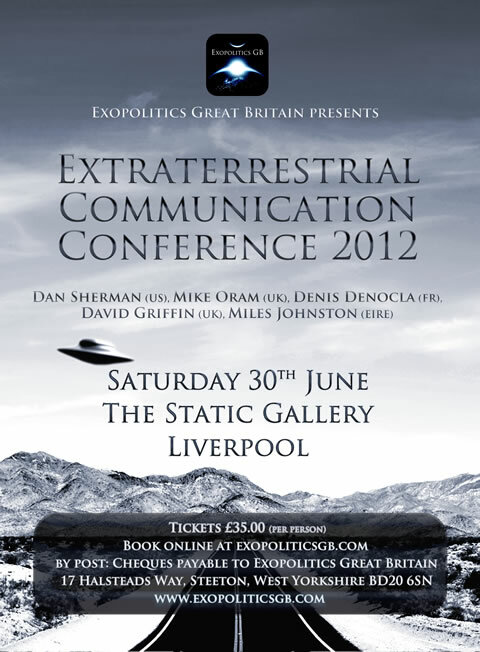 Exopolitics Great Britain is hosting two events this year. For the fourth time there will be the main Exopolitics Expo in August, but before then, on June the 30th, they held a one day Extraterrestrial Communication Conference which I attended. The base of operations has now shifted to the Static Gallery in Liverpool where catering is far better; in fact the venue itself has a very cheap and tasty food stall which most of the delegates used. From outside, the Static Gallery looks a bit like a builders’ yard, but when you get inside you’ll see that it is in fact a simple, elegant and very stylish conference centre. I’m familiar with it because it was the location for the 2009 Beyond Knowledge Conference which I attended. I remember it well because I was suffering from the effects of a double sprain at the time. My ankle and wrist were in bandages, and I was hobbling about the place painfully. This conference was only a single day, but a lot was packed into it, as you’ll see if you watch the HPANWO TV reportage. The basic theme, meta-analysis and conclusion of these proceedings is that, astounding as it might seem, some people are being contacted and are communicating with intelligent entities from another world. That’s a remarkable claim to make, I know; but the evidence for it exists. The entities doing the communicating are extremely varied in nature; a huge number of different species have been positively identified. Some types are reported again and again in encounters by very different people who have had no contact with each other. The most common is the “Grey”, a short skinny humanoid with a smooth, featureless body, oversized head and large blank eyes. Also there are the “mantids”; huge, intelligent insectoid beings. Despite their fearsome appearance they are often friendly and compassionate. 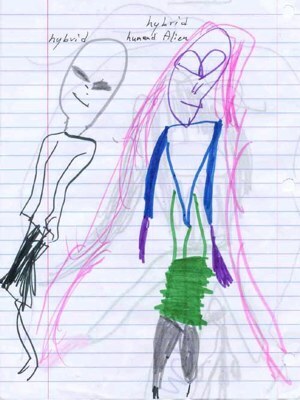 The phrase “blue doctors” was used to describe a creature seen by both a young girl in England and also the American novelist Whitley Strieber. These are squat dwarf-like beings with thick clothing and hairy skin. The Reptoids are similar in appearance to the Reptilians reported by David Icke and others, whom witnesses see shape-shifting in and out of human form. However there’s no reason to think that the two are the same thing. The “Nordics” are the most interesting; they appear almost exactly like humans apart from unnaturally pronounced features, usually bright blond hair and blue eyes. The eyes are often larger than normal and the bone structure unusual. In fact if you dressed a Nordic up in normal clothes and let him walk down a street people wouldn’t run screaming. They might just give him a double take and think: “He looks weird”. People from all over the world, Amazonian Indians to Australian sheep-farmers; African goat-herders to English bank managers; Chinese businessmen to Russian airline pilots, have all seen these very same creatures. The aliens seem to have a wide variety of motives and intents. Some are deeply benevolent, loving and friendly; they often instil the witness with higher spiritual feelings. Sometimes they heal physical and psychological wounds. A person can have their lives changed for the better by encounters with these beings. Some are unpleasant, violent and cause the witness a lot of pain and injury, and even in the most extreme cases death. They have been known to sexually abuse and torture the humans they abduct against their will. Some seem neutrally detached; scientist-like, observing dispassionately. One thing that I often find is that witnesses tend to extrapolate their own ET experiences onto all of ET-dom. This is a mistake, as I explain in my HPANWO TV reportage in the section about Mike Oram. Aliens are enormously varied and behave in a wide variety of ways; there’s no reason to think, as Stephen Greer does, that just because you bump into a nasty ET it’s definitely a MILAB. This brings us onto another topic: Government interest and collaboration. MILABS, MILitary ABductions, do occur. Despite some claims to the contrary, they definitely can’t explain all cases of ET interaction, but they can a few. Sometimes witnesses report both ET’s and humans, in white coats or military uniforms, working together during encounters. It seems that even when governments are not colluding with the aliens they take an interest in those encountering ET’s independently. Contactees may find that their phone gets tapped and mysterious cars follow them along the roads etc. What are these extraterrestrials that are communicating with us? I don’t know. That’s a question that needs answering! They may in reality be a blanket term for a wide variety of phenomena. I don’t think we know for certain that they’re flying here from other stars in spacecraft; there may be another explanation. I’m convinced though that the Skeptical theory: that’s it’s all in our heads, is palpably false. Millions of people all over the world are having experiences with these beings. There is a pile of evidence supporting that they are objectively real. This was a great conference and thanks to everybody who was involved in organizing it; and to everybody else who attended. I’m looking forward to the Exopolitics Expo in August; expect another report from me.